When coming to Manteo, or The Outer Banks, North Carolina, why not stay in one of the quaint Historic Homes of Manteo? The cozy guest house in the heart of historic The Neva Midgett House makes for the perfect vacation rental accommodations for your visit to Roanoke Island and the Outer Banks of North Carolina. The Neva Midgett house is listed on the Manteo Historic Home registery. The two bedroom guest home is located within walking distance to all that Manteo has to offer including quaint bookstores, wonderful restaurants, art museums, Festval Park for open air concerts, galleries and interesting shops. In fact, the Neva Midgett House was once a very popular antique shop and well known to residents and visitors alike. Midgett House is a two bedroom guesthouse offering the perfect combination of privacy, quiet comfort, and easy access to our beautiful historic town. Rise with the sun and go for a jog along the waterfront or relax on your covered front porch with a hot cup of coffee and enjoy the flowers in the gardens. Hop on your bike and be instantly surrounded by the history and mystery of Roanoke Island. 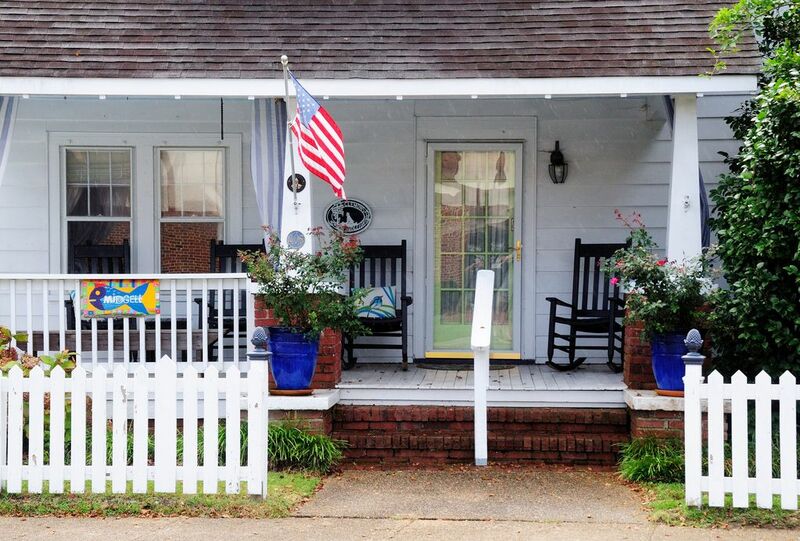 THERE IS NOTHING MIDGET ABOUT Midgett House which includes the entire FIRST floor of this arts and crafts bungalow. The house can accommodate up to 4 guests. You will find two large bedrooms, one with a romantic king size canopy bed and the second with lovely four poster twin beds. The house is filled with period antiques and oriental rugs for your comfort. There is a full bath, a large fully equiped kitchen including a full size refrigerator, microwave, dishwasher, stove, oven and washer and dryer. The comfortable living room features modern amenities including hdtv, vcr, and dvd player. The large dining room will accomodate large family meals or just a fun round of board and card games. From the front door, you will find your own covered porch to enjoy comfortable porch furniture and watch the world go by. The most beautiful beaches in the world of the Outer Banks are located within 5 miles of Manteo. Roanoke Island, centerally located, is perfect for a trip to the northern beaches to see the wild horses roaming freely, or south to the island of Okracoke by ferry. Either way you go, wherever you spend your day, you will return to the privacy and comfort of your own charming house. The Manteo Walking Tour includes many of the historic homes including the Neva Midgett House. Remember to visit the many other wonders of Roanoke Island. The Lost Colony is performed nightly during the summer months. The North Carolina Aquarium is a quick drive to the original on Roanoke Island and to the new Aquarium opening in May 2011 on the pier in Nags Head. The Elizabethean Gardens are to die for--beautiful. We had a wonderful stay at the Midgett cottage. Great location.... just walk three blocks down to the center of the village. We biked a lot and had a few drinks each afternoon on the front porch ! Would love to stay again. Maybe try the smaller cottage in the back !? Perfect for 2 to 4 people but this time it was just two of us. Plenty of room with full cable TV ! The Midgett House was perfect for our family of 4! We enjoyed being able to walk or ride our bikes to all Manteo has to offer. The house was very comfortable and nicely decorated. Sharon is very sweet to work with and made sure we had what we needed. We would definitely stay here again! Another perfect time at the Midgett Cottage on Budleigh Street... comfy and convenient to everything in Mayberry... I mean, Manteo. Also to all the OBX. A Shout-out to some yummy food at Sam and Omie’s. We loved our stay at the Midgett House. It was charming and cozy and had everything we needed. Our toddler granddaughter was enchanted by the fairy garden in the back; it even had a mermaid. We could walk her to the play area at the waterfront and the nice lady at Perk put extra sprinkles on her hot chocolate. We like history and discovered the city cemetery close by. The house has lots of guide books and histories so you can learn a great deal about the area. We are frequent visitors to Manteo, and have found a second home. Very nice home. We were very comfortable and liked being in touch with Sharon, the owner. We would definitely recommend staying there. Nice place to simply relax. Pet friendly. Bed very comfortable. Nice to have washer dryer. Parking could not be more convenient.